Copyright © 2017 W3C® (MIT, ERCIM, Keio, Beihang). W3C liability, trademark and permissive document license rules apply. The Payment Request API provides a standard way to initiate payment requests from Web pages and applications. User agents implementing that API prompt the user to select a way to handle the payment request, after which the user agent returns a payment response to the originating site. This specification defines capabilities that enable Web applications to handle payment requests. The Web Payments Working Group maintains a list of all bug reports that the group has not yet addressed. This draft highlights some of the pending issues that are still to be discussed in the working group. No decision has been taken on the outcome of these issues including whether they are valid. Pull requests with proposed specification text for outstanding issues are strongly encouraged. This document was published by the Web Payments Working Group as a First Public Working Draft. This document is intended to become a W3C Recommendation. Publication as a First Public Working Draft does not imply endorsement by the W3C Membership. This is a draft document and may be updated, replaced or obsoleted by other documents at any time. It is inappropriate to cite this document as other than work in progress. The Web Payments Working Group seeks to streamline payments on the Web to help reduce "shopping cart abandonment" and make it easier to deploy new payment methods on the Web. It has published the Payment Request API [ payment-request ] as a standard way to initiate payment requests from E-Commerce Web sites and applications. An origin-based permission to handle payment request events. A payment request event type (PaymentRequestEvent). A payment handler is an event handler for the PaymentRequestEvent. An extension to the service worker registration interface (PaymentManager) to manage the definition, display, and user selection of PaymentInstruments. A mechanism to respond to the PaymentRequestEvent. This specification does not address how software built with operating-system specific mechanisms (e.g., "native mobile apps") handle payment requests. The term "payment app" may be useful as a shorthand for "Web app that can handle payments with Payment Request API." The key words MAY, MUST, NOT REQUIRED, SHOULD, and SHOULD NOT are to be interpreted as described in [ RFC2119 ]. A user agent MUST behave as described in this specification to be considered conformant. In this specification, user agent means a Web browser or other interactive user agent as defined in [ HTML5 ]. User agents MAY implement algorithms given in this specification in any way desired, so long as the end result is indistinguishable from the result that would be obtained by the specification's algorithms. This specification uses both the terms "conforming user agent(s)" and "user agent(s)" to refer to this product class. This specification relies on several other underlying specifications. The terms payment method, PaymentRequest, PaymentResponse, supportedMethods, paymentDetailsModifier, paymentDetailsInit, PaymentMethodData, ID, show(), and user accepts the payment request algorithm are defined by the Payment Request API specification [ payment-request ]. The terms Promise, internal slot, TypeError, and JSON.stringify are defined by [ ECMA-262-2015 ]. The term JSON-serialize applied to a given object means to run the algorithm specified by the original value of the JSON.stringify function on the supplied object, passing the supplied object as the sole argument, and return the resulting string. This can throw an exception. The terms payment method identifier is defined by the Payment Method Identifier specification [ payment-method-id ]. The terms basic-card, supportedNetworks, and supportedTypes are defined in [ payment-method-basic-card ]. The terms global object, top-level browsing context, structured clone, event handler, event handler event type, trusted event, and user interaction task source are defined by [ HTML5 ]. The term origin is defined in [ RFC6454 ]. The term fires (an event) is defined in [ DOM4 ]. The term secure context is defined by the Secure Contexts specification [ SECURE-CONTEXTS ]. The terms service worker, service worker client, ServiceWorkerRegistration, ServiceWorkerGlobalScope, handle functional event, extend lifetime promises, and scope URL are defined in [ SERVICE-WORKERS ]. An origin requests permission from the user to handle payment requests for a set of supported payment methods. For example, a user visiting a retail or bank site may be prompted to register a payment handler from that origin. The origin establishes the scope of the permission but the origin's capabilities may evolve without requiring additional user consent. Although from a permissions perspective there is a single Web app per origin, this specification provides mechanisms to origins for flexible structuring and display of instruments and wallets. Payment handlers are defined in service worker code. A list of enabled payment methods. [Optionally] the conditions under which the handler supports a given payment method; these capabilities play a role in matching computations. Information for organizing the display and grouping of instruments and wallets supported by the payment handler. When the merchant (or other payee) calls the [ payment-request ] method show() (e.g., when the user pushes a button on a checkout page), the user agent computes a list of candidate payment handlers, comparing the payment methods accepted by the merchant with those supported by registered payment handlers. For payment methods that support additional filtering, merchant and payment handler capabilities are compared as part of determining whether there is a match. The user agent displays a set of choices to the user: the registered instruments of the candidate payment handlers. The user agent displays and groups these choices according to information (labels and icons) provided at registration or otherwise available from the Web app. When the user (the payer) selects an instrument, the user agent fires a PaymentRequestEvent (cf. the user interaction task source) in the service worker whose PaymentManager the instrument was registered with. The PaymentRequestEvent includes some information from the PaymentRequest (defined in [ payment-request ]) as well as additional information (e.g., origin and selected instrument). Once activated, the payment handler performs whatever steps are necessary to handle the payment request, and return an appropriate payment response to the payee. If interaction with the user is necessary, the payment handler can open a window for that purpose. The user agent receives a response asynchronously once the payment handler has finished handling the request. The response becomes the PaymentResponse (of [ payment-request ]). An origin may implement a payment app with more than one service worker and therefore multiple payment handlers may be registered per origin. The handler that is invoked is determined by the selection made by the user of a payment instrument. The service worker which stored the payment instrument with its PaymentManager is the one that will be invoked. The logic of a payment handler is driven by the payment methods that it supports. Some payment methods, such as basic-card expect little to no processing by the payment handler which simply returns payment card details in the response. It is then the job of the payee website to process the payment using the returned data as input. In contrast, some payment methods, such as a crypto-currency payments or bank originated credit transfers, require that the payment handler initiate processing of the payment. In such cases the payment handler will return a payment reference, endpoint URL or some other data that the payee website can use to determine the outcome of the payment (as opposed to processing the payment itself). Handling a payment request may include numerous interactions: with the user through a new window or other APIs (such as [ WebCryptoAPI ]) or with other services and origins through web requests or other means. how the user establishes an account with an origin that provides payment services. how an origin authenticates a user. how communication takes place between the payee server and the payee Web application, or between a payment app origin and other parties. Thus, an origin will rely on many other Web technologies defined elsewhere for lifecycle management, security, user authentication, user interaction, and so on. Fig. 1 A Web payment app is associated with an origin. Payment handlers respond to PaymentRequestEvents. PaymentManagers manage the definition, display, and user selection of PaymentInstruments. A PaymentInstrument supports one or more payment methods. A PaymentWallet contains one or more PaymentInstruments and may be used to enhance the user experience (e.g., business wallet and personal wallet). This specification does not address how third-party mobile payment apps interact (through proprietary mechanisms) with user agents, or how user agents themselves provide simple payment app functionality. Fig. 2 Payment Handler API enables Web apps to handle payments. Other types of payment apps may use other (proprietary) mechanisms. This specification extends the ServiceWorkerRegistration interface with the addition of a paymentManager attribute. The PaymentManager is used by payment apps to manage their associated wallets, instruments and supported payment methods. This attribute allows manipulation of payment instruments associated with a service worker (and therefore its payment handler). To be a candidate payment handler, a handler must have at least one registered payment instrument to present to the user. That instrument needs to match the payment methods and required capabilities specified by the payment request. This attribute is used to group payment instruments (e.g., to group together "business account" payment instruments separately from "personal account" payment instruments). Developers can provide a name and icon for such a group. The use of this grouping mechanism by payment handlers is completely optional. If payment handlers use this grouping mechanism, then matching payment instruments that do not appear in any groups should still be presented to users by the user agent for selection. Issue 98: Support grouped display of payment instruments? Should the API support providing grouping information ("wallets") to the user agent? What should requirements be on user agents to display or provide for user interaction with this information? The means for code requesting permission to handle payments is not yet defined. The user agent is NOT REQUIRED to prompt the user to grant permission to the origin for each new supported payment method. The PaymentInstruments interface represents a collection of payment instruments, each uniquely identified by an instrumentKey. The instrumentKey identifier will be passed to the payment handler to indicate the PaymentInstrument selected by the user. Let p be a new promise. If the collection contains a PaymentInstrument with a matching instrumentKey, remove it from the collection and resolve p with true. Otherwise, resolve p with false. If the collection contains a PaymentInstrument with a matching instrumentKey, resolve p with that PaymentInstrument. Otherwise, reject p with a DOMException whose value is "NotFoundError". Resolve p with a Sequence that contains all the instrumentKeys for the PaymentInstruments contained in the collection, in original insertion order. If the collection contains a PaymentInstrument with a matching instrumentKey, resolve p with true. If the collection contains a PaymentInstrument with a matching instrumentKey, replace it with the PaymentInstrument in details. Otherwise, insert the PaymentInstrument in details as a new member of the collection and associate it with the key instrumentKey. Remove all PaymentInstruments from the collection and resolve p.
It be useful to have a clear() method for interfaces that store things. The name member is a string that represents the label for this PaymentInstrument as it is usually displayed to the user. The icons member is an array of image objects that can serve as iconic representations of the payment instrument when presented to the user for selection. The enabledMethods member is a list of one or more payment method identifiers of the payment methods supported by this instrument. The capabilities member is a list of payment-method-specific capabilities that this payment handler is capable of supporting for this instrument. For example, for the basic-card payment method, this object will consist of an object with two fields: one for supportedNetworks, and another for supportedTypes. ImageObjects comes from the Web App Manifest specification. Should we reference the definition normatively, or make use of a simpler structure here? Wallets are collections of payment instruments. Where it appears, the walletKey argument is a unique identifier for the wallet. If the collection contains a PaymentWallet with a matching walletKey, remove it from the collection and resolve p with true. If the collection contains a PaymentWallet with a matching walletKey, resolve p with that PaymentWallet. Resolve p with a sequence that contains all the walletKeys for the PaymentWallets contained in the collection, in original insertion order. If the collection contains a PaymentWallet with a matching walletKey, resolve p with true. If the collection contains a PaymentWallet with a matching walletKey, replace it with the PaymentWallet in details. Otherwise, insert the PaymentWallet in details as a new member of the collection and associate it with the key walletKey. Remove all PaymentWallets from the collection and resolve p.
See issue 129 and issue 153. The name member is a string that represents the label for this wallet as it is usually displayed to the user. The icons member is an array of image objects that can serve as iconic representations of the wallet when presented to the user for selection. The instrumentKeys member is a list of one or more instrumentKeys from PaymentManager.instruments, indicating which PaymentInstrument objects are associated with this Wallet, and should be displayed as being "contained in" the wallet. While it is not generally good practice, there is no restriction that prevents a PaymentInstrument from appearing in more than one Wallet. requestPermission() is not yet defined. The code below is based on one potential model, but this is likely to change. return; // not supported, so bail out. // Note -- it's not clear how this should work yet; see Issue 94. // Excellent, we got it! Let's now set up the user's cards. After applying the matching algorithm defined in Payment Request API, the user agent displays a list of instruments from matching payment apps for the user to make a selection. This specification includes a limited number of display requirements; most user experience details are left to implementers. The user agent MUST favor user-side order preferences (based on user configuration or behavior) over payee-side order preferences. The user agent MUST display matching payment handlers in an order that corresponds to the order of supported payment methods provided by the payee, except where overridden by user-side order preferences. The user agent SHOULD allow the user to configure the display of matching payment handlers to control the ordering and define preselected defaults. Issue 116: PR API payment method ordering and relation to this spec. The second bullet above may be deleted based on PR API issue 481. For a given Web site, display payment handlers in an order that reflects usage patterns for the site (e.g., a frequently used payment handler at the top, or the most recently used payment handler at the top). Enable the user to set a preferred order for a given site or for all sites. If the origin of the site being visited by the user matches the origin of a payment handler, show the payment handler at the top of the list. The Working Group has discussed two types of merchant preferences related to payment apps: (1) highlighting merchant-preferred payment apps already registered by the user and (2) recommending payment apps not yet registered by the user. The current draft of the specification does not address either point, and the Working Group is seeking feedback on the importance of these use cases. Note that for the second capability, merchants can recommend payment apps through other mechanisms such as links from their web sites. The user agent MUST enable the user to select any displayed instrument. At a minimum, we expect user agents to display an icon and label for each matching origin to help the user make a selection. In some contexts (e.g., a desktop browser) it may be possible to improve the user experience by offering additional detail to the user. For example, if the user's "bank.com" origin knows about two credit cards (thus, two potential responses to the same payment method "basic-card"), the user agent could display each credit card's brand and the last four digits of the card to remind the user which cards the origin knows about. In issue 98 there has been push-back to always requiring display of instruments (e.g., on a mobile devices). User agents can incrementally show instruments. Or user agents can return an empty instrumentKey and it becomes the payment app's responsibility to display instruments to the user. A Wallet is a grouping of instruments for display purposes. 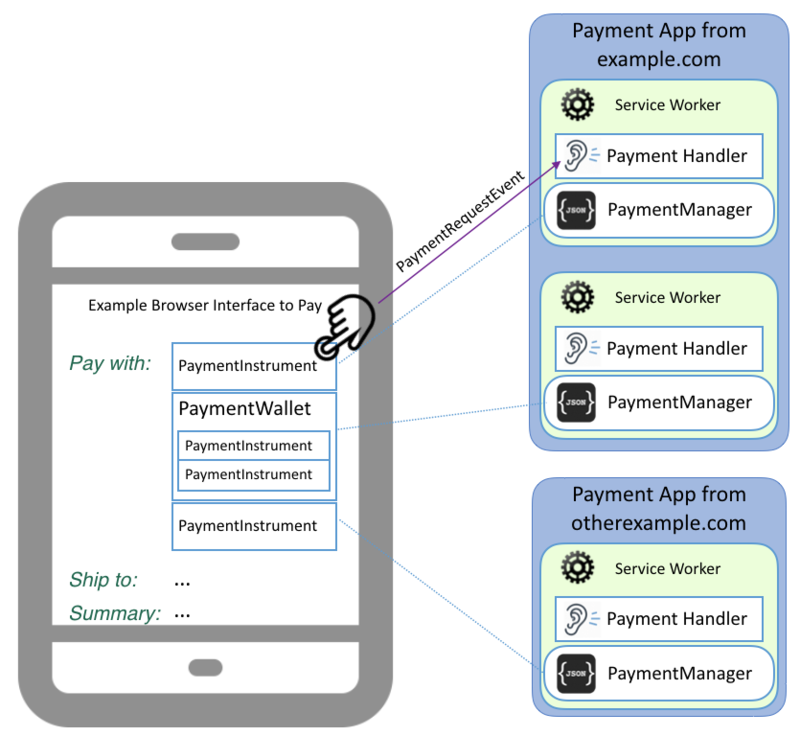 To enable developers to build payment apps in a variety of ways, we decouple the registration (and subsequent display) of instruments from how payment handlers respond to a PaymentRequestEvent. However, the user agent is responsible for communicating the user's selection in the event. Users agents may wish to enable the user to select individual displayed Instruments. The payment handler would receive information about the selected Instrument and could take action, potentially eliminating an extra click (first open the payment app then select the Instrument). Again related to issue 98: Should we require that, if displayed, individual instruments must be selectable? Or should we allow flexibility that instruments may be displayed, but selecting any one invokes all registered payment handlers? One idea that has been suggested: the user agent (e.g., on a mobile device) could first display the app-level icon/logo. Upon selection, the user agent could display the Instruments in a submenu. Once the user has selected an Instrument, the user agent fires a PaymentRequestEvent and uses the subsequent PaymentAppResponse to create a PaymentReponse for [ payment-request ]. Payment Request API supports delegation of responsibility to manage an abort to a payment app. There is a proposal to add a paymentRequestAborted event to the Payment Handler interface. The event will have a respondWith method that takes a boolean parameter indicating if the paymentRequest has been successfully aborted. This specification extends the ServiceWorkerGlobalScope interface. The onpaymentrequest attribute is an event handler whose corresponding event handler event type is paymentrequest. The PaymentRequestEvent represents a received PaymentRequest. This attribute is a string that indicates the origin of the top level payee web page. The string MUST be formatted according to the "Unicode Serialization of an Origin" algorithm defined in section 6.1 of [ RFC6454 ]. This attribute is a string that indicates the origin where a PaymentRequest was initialized. When a PaymentRequest is initialized in the topLevelOrigin, the attributes have the same value, otherwise the attributes have different values. For example, when a PaymentRequest is initialized within an iframe from an origin other than topLevelOrigin, the value of this attribute is the origin of the iframe. The string MUST be formatted according to the "Unicode Serialization of an Origin" algorithm defined in section 6.1 of [ RFC6454 ]. When getting, the paymentRequestId attribute returns the [[details]]. id from the PaymentRequest that corresponds to this PaymentRequestEvent. This attribute contains PaymentMethodData dictionaries containing the payment method identifiers for the payment methods that the web site accepts and any associated payment method specific data. It is populated from the PaymentRequest using the MethodData Population Algorithm defined below. This attribute indicates the total amount being requested for payment. It is initialized with a structured clone of the total field of the PaymentDetailsInit provided when the corresponding PaymentRequest object was instantiated. This sequence of PaymentDetailsModifier dictionaries contains modifiers for particular payment method identifiers (e.g., if the payment amount or currency type varies based on a per-payment-method basis). It is populated from the PaymentRequest using the Modifiers Population Algorithm defined below. This attribute indicates the PaymentInstrument selected by the user. It corresponds to the instrumentKey provided to the PaymentManager.instruments interface during registration. This method is used by the payment handler to show a window to the user. When called, it runs the open window algorithm. This method is used by the payment handler to provide a PaymentAppResponse when the payment successfully completes. Issue 123: Share user data with payment app? Should payment apps receive user data stored in the user agent upon explicit consent from the user? The payment app could request permission either at installation or when the payment app is first invoked. For DOM events compatibility, need to add a constructor, and the members of the corresponding dictionary need to match the attributes of the event. Set registeredMethods to an empty set. For each PaymentInstrument instrument in the payment handler's PaymentManager.instruments, add all entries in instrument.enabledMethods to registeredMethods. Create a new empty Sequence. Set dataList to the newly created Sequence. Set inData to the item under consideration. Set commonMethods to the set intersection of inData.supportedMethods and registeredMethods. If commonMethods is empty, skip the remaining substeps and move on to the next item (if any). Create a new PaymentMethodData object. Set outData to the newly created PaymentMethodData. Set outData.supportedMethods to a list containing the members of commonMethods. Set outData.data to a structured clone of inData.data. Set modifierList to the newly created Sequence. Set inModifier to the item under consideration. Set commonMethods to the set intersection of inModifier.supportedMethods and registeredMethods. Create a new PaymentDetailsModifier object. Set outModifier to the newly created PaymentDetailsModifier. Set outModifier.supportedMethods to a list containing the members of commonMethods. Set outModifier.total to a structured clone of inModifier.total. [[windowClient]] null The currently active WindowClient. This is set if a payment handler is currently showing a window to the user. Otherwise, it is null. Let registration be the ServiceWorkerRegistration corresponding to the PaymentInstrument selected by the user. If registration is not found, reject the Promise that was created by PaymentRequest.show() with a DOMException whose value is "InvalidStateError" and terminate these steps. Set global to the global object that was provided as an argument. Create a trusted event, e, that uses the PaymentRequestEvent interface, with the event type paymentrequest, which does not bubble, cannot be canceled, and has no default action. Set the topLevelOrigin attribute of e to the origin of the top level payee web page. Set the paymentRequestOrigin attribute of e to the origin of the context where PaymentRequest was initialized. Set the paymentRequestId attribute of e to the [[details]].id from the PaymentRequest. Set the methodData and modifiers attributes of e by executing the MethodData Population Algorithm and Modifiers Population Algorithm respectively. Set the total attribute of e to a structured clone of the total field on the PaymentDetailsInit from the corresponding PaymentRequest. Set the instrumentKey attribute of e to the instrumentKey of the selected PaymentInstrument. Wait for all of the promises in the extend lifetime promises of e to resolve. If the payment handler has not provided a PaymentAppResponse, reject the Promise that was created by PaymentRequest.show() with a DOMException whose value "OperationError". The payment handler opens a window for the user to provide an authorization code. The payment handler opens a window that makes it easy for the user to confirm payment using default information for that site provided through previous user configuration. When first selected to pay in a given session, the payment handler opens a window. For subsequent payments in the same session, the payment handler (through configuration) performs its duties without opening a window or requiring user interaction. A payment handler that requires visual display and user interaction, may call openWindow() to display a page to the user. Since user agents know that this method is connected to the PaymentRequestEvent, they SHOULD render the window in a way that is consistent with the flow and not confusing to the user. The resulting window client is bound to the tab/window that initiated the PaymentRequest. A single payment handler SHOULD NOT be allowed to open more than one client window using this method. This algorithm resembles the Open Window Algorithm in the Service Workers specification. Should we refer to the Service Workers specification instead of copying their steps? Let event be this PaymentRequestEvent. Let request be the PaymentRequest that triggered this PaymentRequestEvent. If request. [[state]] is not "interactive", then return a Promise rejected with a DOMException whose name is " InvalidStateError". Let url be the result of parsing the url argument. If the url parsing throws an exception, return a Promise rejected with that exception. If url is about:blank, return a Promise rejected with a TypeError. Let promise be a new Promise. Let newContext be a new top-level browsing context. Navigate newContext to url, with exceptions enabled and replacement enabled. If the navigation throws an exception, reject promise with that exception and abort these steps. Reject promise with a DOMException whose name is "SecurityError". Let client be the result of running the create window client algorithm with newContext as the argument. If event. [[windowClient]].visibilityState is not "unloaded", reject promise with a DOMException whose name is " InvalidStateError" and abort these steps. This example shows how to write a service worker that listens to the PaymentRequestEvent. When a PaymentRequestEvent is received, the service worker opens a window to interact with the user. The Web Payments Working Group plans to revisit these two examples. The payment method identifier for the payment method that the user selected to fulfil the transaction. A JSON-serializable object that provides a payment method specific message used by the merchant to process the transaction and determine successful fund transfer. The user agent receives a successful response from the payment handler through resolution of the Promise provided to the respondWith() function of the corresponding PaymentRequestEvent dictionary. The application is expected to resolve the Promise with a PaymentAppResponse instance containing the payment response. In case of user cancellation or error, the application may signal failure by rejecting the Promise. Letting the user try again, with the same payment handler or with a different one. Rejecting the Promise that was created by PaymentRequest.show(). Set appResponse to the PaymentAppResponse instance used to resolve the PaymentRequestEvent.respondWith() Promise. If appResponse.methodName is not present or not set to one of the values from PaymentRequestEvent.methodData, run the payment app failure algorithm and terminate these steps. Create a structured clone of appResponse.methodName and assign it to response.methodName. If appResponse.details is not present, run the payment app failure algorithm and terminate these steps. Create a structured clone of appResponse.details and assign it to response.details. [ payment-request ] defines an ID that parties in the ecosystem (including payment app providers and payees) may use for reconciliation after network or other failures. The API does not share information about the user's registered payment handlers. Information from origins is only shared with the payee with the consent of the user. Similarly, user agents should not share payment request information with any payment handler until the user has selected that payment handler. One goal of this specification is to minimize the user interaction required to make a payment. At the same time, user agents must not permit combinations of configurations that would enable invoking Web sites to invoke payment request and receive payments silently. Payment method security is outside the scope of this specification and is addressed by payment handlers that support those payment methods. The Web Payments Working Group is also discussing Payment App authenticity; see the (draft) Payment Method Manifest. Payees should validate that the data they have received through the paymentRequest API is what they expect (e.g., the total that was paid, etc.). When the Payment Request API is invoked in a "private browsing mode," the user agent should launch payment handlers in a private context. This will generally prevent sites from accessing any previously-stored information. In turn, this is likely to require either that the user log in to the origin or re-enter payment instrument details.